It was June, 1942. The world was at war. In Europe, the war had begun in 1939; in the US active engagement had not begun until 1941. Fighting was fierce and the outcome uncertain. After much prodding by scientists, including Albert Einstein, US President Franklin Roosevelt agreed to approve development of an atomic bomb. Thus commenced The Manhattan Project. A debate about the location of the project ensued. It was eventually decided that physical construction of the bomb would take place in a remote location–Los Alamos, New Mexico. This was to be a top-secret effort, joined by scientists from several nations. Work proceeded feverishly. The race was on, participants believed, to beat the enemy in the development of a catastrophic weapon. They were convinced that whoever got the weapon first would likely win the war. When researchers thought they finally had a workable bomb, many wondered if they should test it. Would the world blow up? This was a question actually asked by one of the researchers, Edward Teller. On July 16, 1945 the first atomic bomb was detonated in Los Alamos. Though a few scientists thought the device might not work at all, Enrico Fermi, a lead scientist, took bets on whether or not the explosion would ignite the atmosphere. He speculated that if this happened it was possible that not only New Mexico would be incinerated, but also that the world would be destroyed. While some colleagues thought Fermi was jesting, it was seriously considered that the bomb could turn the whole planet into a bomb. Nonetheless, scientists proceeded with the detonation. As it turned out, they did have a workable bomb. The results of their labor–the first atomic bomb in history–was given to politicians. At this point, WWII in Europe was over. Germany had surrendered in May of ’42. Germany’s defeat allowed the US and its allies to focus energies on the remaining opponent, Japan. Throughout the war there had been two fronts, one in Europe, against Germany and the other in the Pacific, against Japan. Japan was a tenacious and fierce opponent. As German forces withdrew, Japan fought on and showed no intention of bowing before an invading army. Faced with a grueling and bloody ground assault, the US decided to choose a more efficient road to victory over Japan. On August 6, 1945 the atomic bomb was dropped on the city of Hiroshima, Japan. 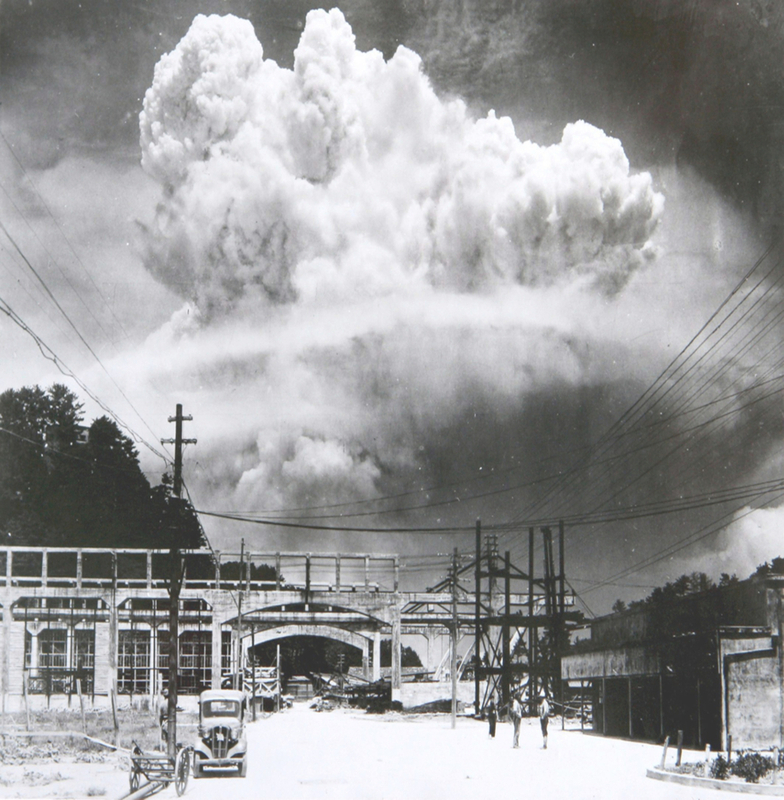 Two days later, a second bomb was dropped on Nagasaki, Japan. Some observers estimate the number of deaths from the Hiroshima blast to have been about 135,000 and from the Nagasaki blast to have been about 75,000. Neither of these figures include long-term exposures to the blast. The Japanese quickly surrendered. Faced with what appeared to be the obliteration of their nation, they agreed to almost every demand made of them. WWII came to an abrupt end and the world entered a new era: the Atomic Age. Much of the above essay was adapted from the book, What is Radioactivity? The Basics, which is a Rhythm Prism publication.